Lightweight: The lightest canoes available, for easy transport and portaging. Strong: Superior strength, and durability. High Performance: Clean, efficient, and fast for easy paddling. Low Maintenance: Requires minimal care and are easily repaired. Stable: Remarkable stability with any load or in rough water. Comfortable: Comfy seats with generous leg room. Beautiful: Options for color, materials, finish, and trim available nowhere else! Custom-Built: Choose your own perfect set-up for materials, weight, seat placement, accessories and looks. Lightweight: Our lightweight canoes are among the lightest canoes available in these sizes. Strong: Not only lighter, but also stronger than other lightweight canoes. I use a high-quality epoxy resin system, which is much stronger than the vinyl-ester resin systems used on almost all other kevlar® canoes. I use more material than other lightweight canoes for excellent strength throughout the hull. Internal skid plates are standard, to protect the most stressed parts of the canoe. Our ribbed canoe floor provides extra toughness as well. I can customize the hull at your request, with extra layers of kevlar and external skid plates for even greater durability. High Performance: Nighthawk Canoes are sleek, with a sharp, clean entry, smooth lines and a symmetrical hull shape. Slight rocker gives good tracking with appropriate maneuverability, and symmetrical bow and stern height help to maintain control in wind. Tumblehome is incorporated for an easier paddling stroke. Relative to other high-end canoes, these canoes compare favorably in efficiency and ease of paddling, but tend to be more stable, even in adverse conditions. A unique combination of performance, safety and comfort. I’ve designed these canoes to be as clean as possible without sacrificing the capacity and stability that usually gets lost in faster racing designs. Low Maintenance: Virtually no maintenance required. Apart from proper storage (to protect from excessive UV exposure), Nighthawk Canoes require very little special attention, and can withstand extremes of temperature without trouble. Wood parts are varnished and sealed for protection from the elements. All hardware is aluminum or stainless steel. Stability: These canoes feature a unique shallow arch hull shape. 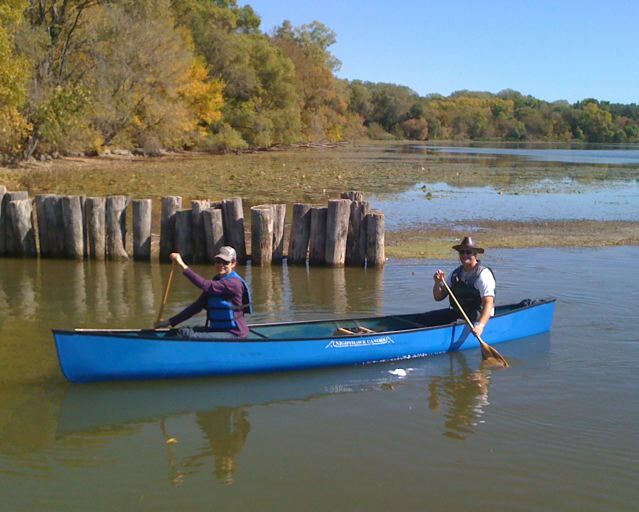 The arched hull allows a canoe to more easily handle rough water, but many other canoe designs over-do the arch and their canoes can feel “tippy” in calm conditions. Nighthawk Canoes are more balanced, with good performance in rough water, but also remain centered in calm conditions and light load. Comfortable: Rather than using hard plastic seats, Nighthawk Canoes all come with large, breathable, webbed seats. Our hull design and seat placement allows for plenty of leg room, and an easy paddling stroke. You may also request custom seat placement, or optional seat backs to fit your paddling style. An Ash carrying yoke is also standard. Beautiful: Finish and colors available nowhere else, with a beautiful glossy finish–what a premium canoe should be. Get your canoe set up exactly the way you want it… be that extra strong or extra light, colors, carbon fiber, custom seat placement, extra seats or tilted seats. Our stock canoe is the best value around, and our custom options make it one-of-a-kind and perfect for your style. Get the canoe you want, not just what happens to be in the shop!